Russ Jackson (left) and Tom Barrett. What started as a simple meeting between two car buffs, Russ Jackson and Tom Barrett, in the early 1960s in Arizona has blossomed over the years into the world’s most prestigious and anticipated collector car auctions and events. 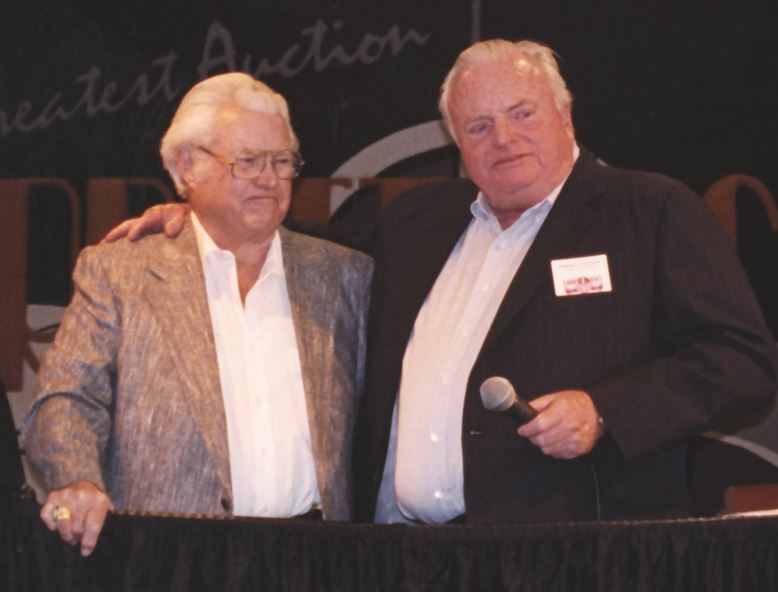 The two men’s car-based friendship resulted in the families working together to stage the “Fiesta de los Autos Elegantes” in 1967, a car show and parade held to raise money for Scottsdale’s art center and to buy books for the community’s library – a commitment to philanthropy that remains with Barrett-Jackson to this day. By the fall of 1971, the car show was phased out and work began on a collector car auction to be held that winter, seeded with 75 vehicles from Jackson’s and Barrett’s personal collections. Held next to the Safari Resort on Scottsdale Road, the auction – with its star vehicles being Barrett’s pair of Mercedes-Benz 770 Phaetons built for the Third Reich and used for all its leaders – was reported live on the national weekend evening news. Over the years, the auction grew exponentially, moving to a larger space some 10 miles north to WestWorld of Scottsdale in 1989, where the massive automotive lifestyle event has remained ever since. The 44th Annual Scottsdale event in 2015 marked the debut of Barrett-Jackson’s new television coverage on Discovery and Velocity, with 36 hours of live broadcasts throughout the United States and Canada, as well as in Spanish to Latin America ‒ another first for the company. The 2015 Scottsdale Auction was highlighted by the extraordinary Ron Pratte Collection of more than 140 incredible vehicles and 1,500 outstanding pieces of automobilia. The record-breaking results sent shock waves throughout the collector car industry. With automobilia sales nearly tripling the world record, and attendance, car sales, charity funds raised and number of cars consigned witnessing a sizable increase, the nine-day event was historic on many levels. Former President George W. Bush at the 2018 Scottsdale Auction. In 2018, Barrett-Jackson achieved two more milestones at the flagship Scottsdale Auction: the achievement of raising more than $100 million for charity since the company’s inception (largely through the auction of vehicles for worthy causes) and the first visit by a former president. 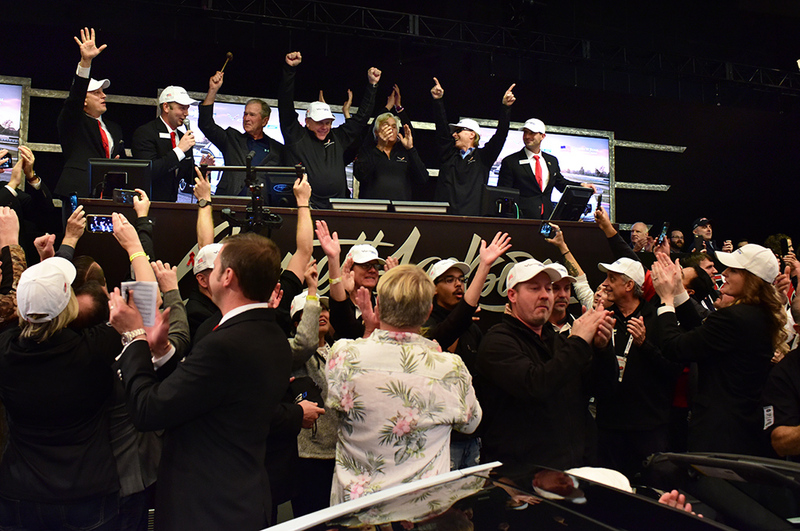 George W. Bush surprised the packed auction arena when he appeared on the auction to help sell a 2018 Carbon 65 Edition Corvette donated by General Motors, which brought in $1.4 million to benefit his Military Service Initiative. The success of the annual Barrett-Jackson Scottsdale event throughout the ’90s led collectors on the East Coast to clamor for their own auction. In 2003, Barrett-Jackson responded, taking its famous auction and lifestyle event across the country to Palm Beach, Florida. With a unique ambiance and collector car lineup that reflects the South Florida setting, the Palm Beach auction has continued to record impressive attendance and sales. To continue acceleration of growth, Barrett-Jackson became one of the first auction houses to offer most of its vehicles at No Reserve, which means these vehicles sold to their highest bidder. This ground-breaking approach initiated in 2005 led to monumental growth for years to come. In 2008, Barrett-Jackson added a Las Vegas event at the Mandalay Bay Resort and Casino, giving auto enthusiasts around the globe a trifecta of car collecting. The event has become a signature Las Vegas attraction, with impressive sales and many celebrity guests. The Las Vegas Auction took on unexpected meaning and became a catalyst for healing when, in 2017, following the tragic shooting in the city, the auction of Barrett-Jackson President Steve Davis’ very special 2007 Ford Shelby GT500 Super Snake was sold for $1 million to benefit Las Vegas first responders. Barrett-Jackson’s inaugural Northeast Auction was held in June 2016 at Mohegan Sun in Connecticut. It marked the first time the company held an event in the Northeastern United States and – coupled with the 14th Annual Palm Beach Auction in April – was also the first time Barrett-Jackson held two collector car auctions on the East Coast in the same calendar year. That first Northeast Auction was an unprecedented success, with tickets selling out shortly after gates opened on Thursday and vehicle consignments closing days ahead of the auction – sparking the first double sellout in the company’s long history. A moving moment in 2017: Steve Davis’ 2007 Shelby GT500 Super Snake sells for $1 million to benefit Las Vegas first responders. As Barrett-Jackson continues to expand its footprint across the country, the company also continues to grow its business with products and services for the car collector and enthusiast. Its first product, a unique palette of new factory packaged automotive colors, was presented in partnership with Planet Color and Sherwin-Williams Automotive. Launched in 2008, the colors were designed to be reminiscent of the greatest muscle cars and those of today’s top custom car builders. In 2009, the company announced its Barrett-Jackson Endorsed Collector Car Insurance, offering cost-effective, comprehensive insurance coverage designed especially for collectors. In 2011 the Barrett-Jackson Signature Car Care line was launched, responding to customers’ requests for a Barrett-Jackson product offering the same protection and shine auction cars receive. In October 2014, the company launched the new Barrett-Jackson Collection Showroom, located in Scottsdale, Arizona. The facility brings the Barrett-Jackson experience to the community beyond the four auctions held across the country each year. The showroom features a rotating selection of premium vehicles that meet the high standards for which Barrett-Jackson is known. The Showroom also has a dedicated service department overseen by an ASE-certified mechanic, offering repair, maintenance and light reconditioning not only of collector cars, but modern specialty cars as well. As the industry continues to evolve, Barrett-Jackson will remain at the forefront by offering the world’s most desirable vehicles and an experience that appeals to everyone. The World’s Greatest Collector Car Auctions® will continue to present unique, quality products and services for the car collector and enthusiast for many more years to come.